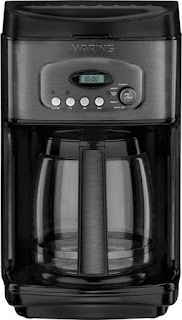 Today only, while supplies last, get this Waring Pro - 14-Cup Coffee Maker for ONLY $29.99 (Retail $99.99)! Offer a mug of hot coffee to everyone in the room with this Waring Pro 14-cup coffee maker. The brew pause function lets you grab a cup before the entire cycle is complete. Set the timer on this programmable Waring Pro 14-cup coffee maker up to 24 hours in advance to ensure a hot cuppa when you want it.